What’s your speciality: I’m basically a jellyfish. How did you pick your Derby name: It was a hell of a process, took me until after my MST. At some point the idea just came to me and now I’m sticking with it. And also: I can sort of almost do a pirouette. 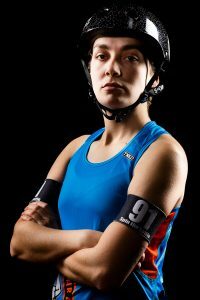 Derby crush (who inspires you and why): My biggest RD celebrity crush is definitely #87 Lil Slinky. Sometimes I wonder if she has some kind of magic shield that prevents any blocker to even get close to her. Insane. Well and I would be a bad Derby Daughter if I didn’t give a special mention to my Derby Parents Wargina and Victoria Siempre. bussibussi In the end though everyone in VRD is an inspiration and I’m so glad to have found such a great group of people. Favorite Bout preparation song: At the moment I’d probably listen to the whole album „6 Feet Beneath the Ground“ by King Krule. Best Derby moment: Every moment is the best. But one moment I will always remember is the first time I was told I was good at a Bout Party by Pepper Jules.